The intolerable, quasi-unthinkable is in the process of creeping into habits.—Isabelle Stengers On August 31, 2015, German chancellor Angela Merkel announced a “heroic” decision to receive about ten thousand refugees stranded at Budapest’s Keleti train station or en route toward Hegyeshalom, on Hungary’s border with Austria. While millions of individuals had departed from their embattled and war-ravaged homelands during the conflict in Syria in search of stability, justice, and a livable future, it was the lone figure seen in a photograph of a drowned three-year-old Syrian boy washed up on the shore near Bodrum, Turkey, on September 2 that seemingly transfigured the emotional landscape of Western Europe. This deeply unsettling image, transcending the politics of borders, led people to rally, however briefly, around a communal dream of being in the world. The unexpected opening of borders to Europe on September 5 set in motion a spontaneous and unprecedented movement of people, mostly along the so-called Balkan route, lasting about six months and accompanied by the spectral euphoria of unprecedented generosity and acts of welcome. Tens of thousands of “people on the move” entered the well-guarded territories of Europe, flows of individuals and families moving from south to north, on foot, trains, buses, taxis, or makeshift vessels. The transitory excitement of welcoming undercut for a brief moment the latent and volatile crisis in the global present. In these months, solidarity and compassion but also engaged activist voluntarism generated localized forces that pushed down walls, frontiers, civil order, and the regulatory systems of the nation-state and the European Union. What was being tested, perhaps, in these short months was the humanitarian sense of social justice and ethics against the slow abrasion of civic values and the toughening social defense systems triggered by the rising tides of autochthonic politics, a phenomenon examined by Nira Yuval Davis in this volume. The transformation of Europe (and subsequently of the United States in the aftermath of the presidential elections in November 2016) into sharply divided spaces of belonging and bordering was foreshadowed by the formation of the European Union in 1993. The fortress, established first as a protection against economically disadvantaged inner European neighbors, soon metamorphosed into a highly regulated and defensive apparatus targeted at the ethnically, socially, religiously, and culturally other. It also ended the short-lived idea of a European multiculturalism and the conception of a new form of communality. Further migrational thrusts after the Arab Spring of the early 2010s led to the buttressing of the southern borders and the formation of a new alliance of the (relatively) affluent (the Club Med states) against the new zones of destabilization along the Mediterranean. These months of hyperactivity and acts of solidarity, signaling hope and the triumph of social justice, foretold a soon-to-come closure, a swift and sharply waged attack against the specter of the stranger, the other, the refugee, represented and stereotyped as an intruder and unmasked as a foreign offense against inherent, localized cultural values. Culture, embodied in the European system of values, was soon placed in the service of those hegemonic majorities defending access to privileges and resources. Perhaps because cultural values were called to testify against those seeking refuge amid our lives, a plethora of artistic and cultural initiatives sought forms of articulation countering the discourses of repulsion and exclusion. Who else, if not artists and cultural practitioners, possesses the expertise and authority to test definitions of identity against the asserted normalizations of certain autochthonous signifiers of we-ness? What if artists and the artistic imagination claim a voice in the political processes of belonging and devise other, novel ways of envisioning hybrid and pluralistic forms of collectivity and communality within today’s experiences of statehood? Is it not, as numerous voices have aptly described, the very moment when alternative practices of we-ness have to be imagined and put to the test, perhaps not so much to counter the existing conditions as to propose fundamental forms of difference? From March to July 2016 visitors, students, and artists from Vienna and around the world came together with thirty-four participants who had arrived in Austria over the previous twelve months from Afghanistan, Syria, Iraq, Eritrea, Somalia, Tajikistan, and Nigeria to collaboratively transform TBA21–Augarten in Vienna into a space of multiple narratives, experiences, and knowledges. Seen from the perspective of visitors, Green light emits two interrelated frequencies. One frequency, publicly visible, involves the production of Green light lamps under the artistic guidance of Studio Olafur Eliasson. During set hours, Green lights were assembled from materials and components that were made available in an ongoing workshop. The crystalline lanterns are polyhedral units fitted with small, green-tinted light fixtures. They are made primarily from recycled and sustainable materials and are designed to be stackable (and scalable), functioning as single objects or assembled into a variety of architectural or sculptural configurations. As a proposition for a modular space of congregation, built around nested functions (working, being, and learning together) that are participatory and shaped in collaboration, the Green lights—which theoretically can be used to build entire cities—are characterized by a fixed unit structure and can sprawl into complexly configured environments. The generative potential of the Green light geometries is reflected in the workshop spaces proposed for the Venice Biennale. Modular elements allow the project to evolve in response to what happens within the space. The most vivid testimonies from participants in Vienna and subsequently in Houston, Texas, attest to the central dimension of learning from one another, with another, and with the other. For the participants, sharing an intimate space of multiple (social) productions over the course of several months led them to embrace difference in terms of cultures, languages, food habits, skills, and interests and to create through the experience of difference an expression of collectivity and communality. Together they forged a space of comfort (and conflict at times) in which they could find and cocreate tools and languages for expressing their experiences, their distress, and the imaginaries of arrival. Relation, as Édouard Glissant has written, is not that which bridges one thing to the other but rather that which connects everything with everything in a “consciousness of Relation.” The “archipelagic” intertwining of individuals demonstrates the potentials of communal production that endorses the idea of the utopian experiment, creating a model situation of difference. Glissant, however, sees differences as pointers not toward irreconcilability but rather toward what relates us, making our being together both complex and creative. Green light - An artistic workshop was developed with the intention of devising a viable infrastructure that can be conceived of as a replicable, sustainable, alternative communal blueprint. The overall design of the project emerges, as discussed, from two models, the workshop and the school, and proposes a somewhat unorthodox alternative to the kinds of administrative regulations and protocols promoted by European governments as “aid work” (or rather imposed as migration policies). While the publicly visible structure of the project tests the fields of artistic and curatorial expertise, the “invisible” challenges require the astute maneuvering of engaged lawyers, partnering NGOs, and a motivated community to mobilize goodwill, to uncover loopholes, and to bend the rules within this overregulated field. In the face of growing desires to foreclose migrational movements and the legal and social obstacles that prevent refugees and asylum seekers from accessing education, work, and therefore social life in their new environments, Green light presents both a comment and a precisely drafted, active response. While immigration quotas are being discussed and strict policies of exclusion made palatable to the electorate, the project takes shape amid a field of multiple impulses of production and mutual learning, catalyzing exchanges and encounters surrounding the fabrication of an unlimited edition of Green light lamps. Rather than centering on an individual artistic vision, it is a platform for multiple participants to partake of shared processes of production, informal exchanges, coexistence, and process-based contributions. The Green light project was conceived by an artist (Olafur Eliasson) in collaboration with an institution (TBA21), its founder (Francesca von Habsburg), and its agents (curators, associated individuals), who collectively manifest a symbolic and economic potency and are thus able to use their public position to bring visibility to the project and to take a stand vis-à-vis the politics of migration. These circumstances accentuate issues of fund-raising, of economic self-sustainability, and of cause-related campaigning. The lamps are offered for sale in the exhibition space and through the Internet for a donation of, respectively, 250 or 300 euros. The proceeds generated by the fund-raising campaign are made available to the participating NGOs and support the shared learning platforms of the project. 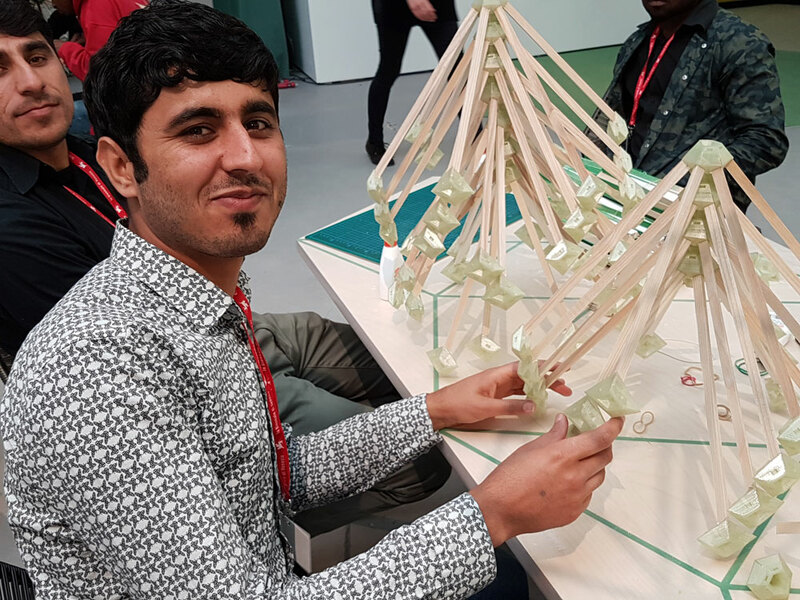 While the lamps are being produced in a workshop setting, their dissemination and display in the public and private realms by engaged supporters signal a welcoming green light to refugees and migrants wherever they appear. It is an active response, by means of art and culture, to the ongoing movement of individuals, families, and entire communities and to the precarious processes of displacement and asylum. The “reclaiming” of the pragmatic field of “refugee work”—and I use these terms very much in quotation marks—leads not only to a highly elaborate project structure but also to a sensitivity to the question of scale and scalability. Green light not only claims to develop an engaged model of collective work, first with a nuclear group of individuals, but also addresses the need for replicability and flexible scalability in different, larger social, artistic, and humanitarian contexts. Developed in Vienna as a pilot project, Green light is thus conceived with the aim to be replicated and to migrate to other institutions or contexts in Europe and beyond, offering in its future incarnations new forms of interaction and the possibility to host more platforms of discussion and relationality. After the initial iteration in Vienna, the workshop migrated to the Moody Art Center in Houston (March to May 2017, with twenty participants) and the 57th Venice Biennale (May to November 2017, with around eighty participants). With smaller teaching seminars led by former participants throughout 2016, during Art Basel; at the International Peace Institute’s Annual Conference in Salzburg, Austria; and at the National Gallery Prague, the Green light formula has as of early 2017 started to live up to its ambition to spur critical moments of transformation. Green light is designed to engage asylum seekers, individuals who have fled their home countries and are applying for international protection (asylum) in a host country. Whereas the rights of asylum are defined by international law, the specific circumstances of application and the bureaucratic processes of assessing an applicant’s rights to protection are overseen by national immigration authorities. Currently the average duration of assessment in Austria is about nine months and can lead to the following outcomes: the granting of asylum (at which point the asylum seeker becomes a legal refugee), refusal (thus making the individual into an illegal immigrant, a sans papiers), and deportation or expulsion according to the Dublin Regulation (under which asylum seekers are returned to the place of entry into the EU). During the lengthy process of application and evaluation by the authorities, asylum seekers in many countries, specifically in Austria in early 2016, are hosted by humanitarian NGOs or government agencies in “camps” (their organization often outsourced to profit-making corporations) or private homes, where they are fed and provided with health insurance. They are, however, denied the right to work and to benefit from language classes or any other form of education, and they are immobilized and somewhat segregated from civic life as they are denied free public transportation and are placed in homes remote from dense social and urban spaces and may be transferred between homes against their will. This life on pause is a situation of great distress und uncertainty. It is the first encounter with a new hosting country (and a potential home) but also one marked by hostility and aggression, at best by neglect. Young people aged sixteen to eighteen are highly vulnerable in this situation. Too old to be given the right to schooling, they are granted special protection until they reach the age of eighteen. For two full years they face stasis, exclusion, isolation, and at times racist stigmatization. Against this backdrop and driven by the uncertainties of the winter months of 2015–16, Green light specifically set out to devise sustainable modes for engaging asylum seekers in practices that can be described as manual activities, offering them basic services (public transportation, food, classes) and finding means of compensation that would not put them at risk. Metamorphosing to accommodate the legal frameworks in each location where it takes place, the overall structure of the project and the legal conditions under which it is hosted have changed significantly as it has traveled to the United States and Italy. In light of the immensity of the processes of transformation that we are undergoing in the global present, some public representatives have symptomatized and stigmatized the so-called migration crisis as “the great evil.” The resulting rhetoric of alienation, combined with the growing pauperization of large parts of societies, have led to mounting borders of fear and to the political exploitation of such uncertainties. The policies that are being drawn up and incrementally implemented are only “symbols of the coming barbarism,” to somewhat polemicize with Isabelle Stengers. The lack of alternatives and alternative politics in the present offers no respite. The short-lived moments of public solidarity in 2015 are minoritarian imaginaries, refuted in many places by the electorate. Where can we thus situate a project like Green light? What political ambitions and visions does it carry, beyond the pragma of momentary relief? Critical authors such as Stengers, Giorgio Agamben, Michel Feher, and Paolo Virno have pointed to the necessity to build, ever so silently, new communities to come. Rather than thinking #opposition, engaging with protest and the short-lived magma of revolt, they all propose in one way or another the organization of social bodies around different ethics of social and environmental justice. The heterogeneous fields of experience on every individual constitutive level, however—age, nation, education, social status, language, and so on—beg the question: how can we establish systems of collectivity that transgress these markers of identity? Virno proposes the slightly contradictory but nonetheless highly productive notion of “engaged withdrawal” when addressing the question of how to act. How can we use this figure? On the one hand, it contains a certain form of political mapping of the present condition through engagement, thereby extrapolating the main structural tendencies we find in the current moment. As a critique it is a form of articulation. On the other hand, it sympathizes with the idea of radical politics as exile and withdrawal. But in what ways can those take part in this critique “who don’t have part”? How can their articulation be articulated? How can an arts institution bypass a legal apparatus that excludes those seeking refuge from civic processes of civil society? Can asylum seekers be engaged in any form of social abstraction here and now? Creating new communities beyond the signifiers of traditional identities is a central ambition of the Green light project. And yet Green light also contains an outward-directed demand, directed at everyone who solidarizes with its ambitions, for the necessity of change, for together fabricating alternatives to the prevailing status quo. Difference and the constitution of multi-identitarian societies are our greatest challenges. This represents much more than building lamps together. And yet the Green light lamps, as solitary and complex “speaking objects,” carry many of the narratives their makers wish to express. They allow us to reflect on and to share the personal experience of migration, departure, and arrival that the participants have experienced and to find and reinterpret together with them what they have left behind but also what they are finding in the moments of arrival. Their exodus from their homes and communities is a very present memory in their lives, but through the day-to-day realities of the workshop they encounter the possibility of building new communities and new families in which they can express and share their skills, wisdom, and experiences.